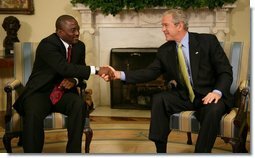 PRESIDENT BUSH: It's my honor to welcome back to the Oval Office President Kabila. Thanks for coming, sir. The President of the Democratic Republic of the Congo. The last time the President was here we talked about his desire to have free and fair elections in his country. Since that time his country has had free and fair elections. And my first order of business today was to congratulate the President for garnering 58 percent of the vote. We talked about the need to work together to help consolidate the gains. We talked about the need to -- for the United States to partner with the country to help on economic development. One of the things the President recognizes is the need for there to be investment in his country, so people can find work, and the stability that comes with economic development. And I appreciate your recognition of the opportunity to work together. We talked about the eastern part of his country. And he shared with me his strategy to make sure that the government's reach extends throughout the entire country and that there is stability throughout the country. And I want to thank you very much for sharing your thoughts with me. I did bring up my desire to help our friend deal with malaria. Malaria is a great concern to me and my wife and the Secretary of State. This is an issue that can be solved. We hurt when young babies are dying from a mosquito bite, knowing full well that a strategy could help save lives. So the President shares the same sense of compassion I do for people all throughout the world who are being affected by malaria. Mr. President, you are -- you've said that you wanted there to be free and fair elections, and you delivered. And I appreciate that and congratulate you on being a man of your word. And we look forward to continuing to work with you, sir, to bring peace and stability to the neighborhood. So, welcome. PRESIDENT KABILA: Well, Mr. President, thanks a lot. Of course, this is the second time that we meet in the Oval Office. Yes, elections were also high on the agenda in 2003. We organized those elections. And basically our priorities have now changed from elections, it's now stability, and with stability, peace and development. And I emphasized and insisted on the fact that we need continued support by the United States in order to achieve these two remaining goals, which is basic stability throughout the whole country and embark on a very, very long journey of development and really try to combat poverty, which is the biggest issue not only in the Congo, but in the region and on the African continent. So thanks a lot for the continued support that we've always had from the United States government and the administration. And together, let's move further and further ahead. PRESIDENT BUSH: Yes, sir. Glad you're here. Thank you.